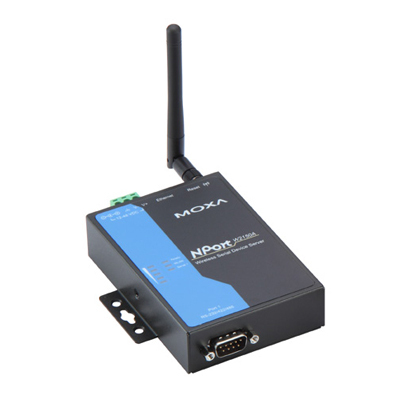 The Moxa Serial Device Server can be quickly connected to your CNCs serial port with a short serial cable, and is powered with a single 12vdc power cube (not shown). Fanuc controls can also provide power to the Moxa unit from the CNC's serial port with a special cable. The Moxa unit can be magnetically attached to the outside of the CNC or mounted inside the cabinet , which provides for an exceptionally clean installation. Once connected, the Wireless Ethernet Adapter is configured from your DNC computer, and the COM port then becomes accessible to communications software running on that PC. The Wireless Ethernet Adapter automatically connects with most commercially available 802.11b/g/n wireless access points (WAP) with a "line-of-sight" range of about 300 feet. Signal boosters are also available to extend the range of the wireless access point if necessary. This new Wireless Adapter makes the powerful features of our PC-DNC Plus or Pro software available to both wireless and conventional "wired" DNC connections. The DLink 2360 Access point is a powerful, yet easy-to-install access point that is ideal for shop-floor communications systems. It has POE (Power 0ver Ethernet) so the unit can be located where there is no AC power outlet. Instead, a power supply is used at the Ethernet switch end of the cable, where AC power almost always exists (to power the switch). A 100 ft CAT5E Ethernet cable is also supplied with our kits, along with the power supply for the DLink access point. 1) A wireless connection completely eliminates the possibility of blown serial ports due to power surges or "ground-loop" conditions. If you've ever damaged COM ports in your computer or in your CNC control, you know how expensive and inconvenient this can be. 2) Wireless Ethernet eliminates the cause of many data transmission errors that occur when using long RS232 cables. Any RS232 cables used to connect our wireless adapter to your CNC control are well shielded and very short, making very high baud rates possible. 3) Since no cables need to be run between your DNC computer and your CNC control, the cost and inconvenience of installing these cables is eliminated. This can be a very helpful if your shop's ceilings are high, or if overhead equipment (such as cranes) makes the routing of DNC cables very difficult. Needless to say, not every DNC connection needs to be wireless. This is why our PC-DNC Plus system lets you mix wired and wireless DNC connections on the same DNC system. Some of your machines could use the wireless Ethernet adapter, while other machines continue to use conventional RS232 serial or "wired" Ethernet connections. Our powerful PC-DNC Plus software will communicate with wired or wireless CNCs in exactly the same way. If you're interested in having a new "state-of-the-art" wireless DNC system in your shop, give us a call. We'll be glad to discuss your needs and offer you the very best prices on hardware, software, and any on-site installation and training that you may require. PC-DNC Plus or Pro is available as a fully installed (turn-key) system, or as a do-it-yourself kit for those of you who feel up to the task.